Ever shoot your handgun and get perfect groups...just not where you want them? If you're having trouble hitting the bullseye, don't jump right to blaming the pistol and don't give up just yet. 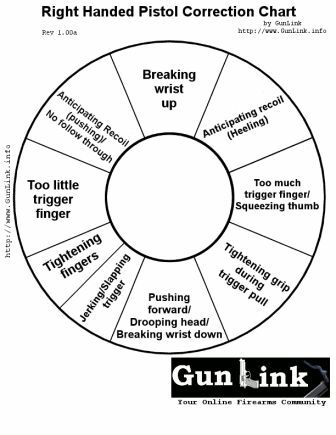 Many things can affect how you shoot your handgun including your grip, your stance, breathing, flinching or any number of other things. 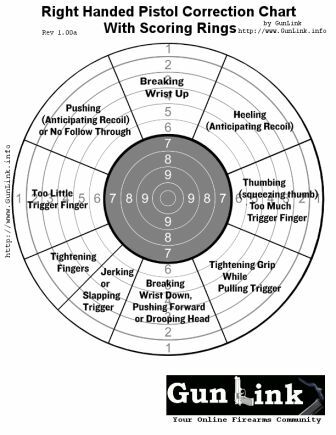 While not guaranteed to improve your pistol shooting abilities, we've had good results using pistol correction chart targets like those below to help diagnose and correct bad habits related to pistol shooting. 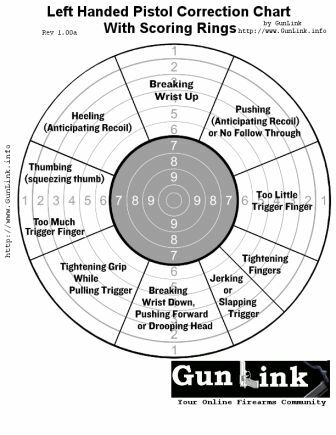 The charts are derived from data in the United States Army Marksmanship Training Unit Manual, The UIT (now ISSF) Pistol Book by John Chandler and the Target Pistol Shot Analysis documents from Target Shooting Canada. If your round is hitting high-center, your wrist may be breaking upward as you fire. Be sure to keep your wrist firm. If your round is hitting low-center, your wrist may be breaking downward as you fire or you may be pushing forward or drooping your head as you fire. If your round is hitting center-left, you may be using too little of your trigger finger. Many agree that a good trigger finger placement is to have the trigger at your distal joint (the joint between the pads of your fingertip and mid-finger). 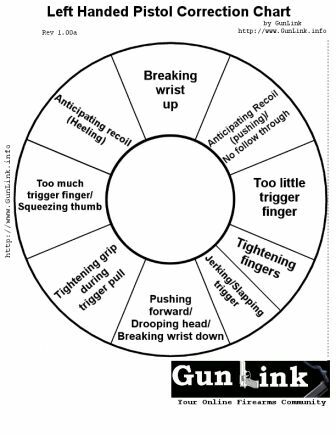 If your round is hitting center-right, you may be using too much trigger finger or you could be "thumbing" the pistol. Many agree that a good trigger finger placement is to have the trigger at your distal joint (the joint between the pads of your fingertip and mid-finger). Also be sure not to try to squeeze the pistol grip too firmly with the thumb of your trigger hand. If your round is hitting high-left, you may be pushing the pistol in anticipation of recoil or may not be following through on your shot. Be sure to keep your wrist firm enough to account for recoil but not so firm that your muscles move the gun before/during/after the shot. Also, remember to keep proper form and grip throughout the shot. If your round is hitting high-right, you may be heeling in anticipation of the handgun's recoil. See note above. If your round is hitting low-left (around 8 o'clock), you may be tightening your fingers too much as you fire the pistol. Hold your hand straight out in front of you and fold your fingers back and press the pads of your fingertips onto the heel of your hand. Generally, your hand will try to move slightly toward the inside of your wrist as your muscles tighten. You can see how this could be problematic. If your round is hitting lower-left (around 7 o'clock), you may be jerking or slapping the trigger during your shot. Make sure that your trigger pull is smooth and deliberate. If your round is hitting low-right, you may be tightening your grip during your trigger pull. Hold your hand straight out in front of you and clench your fist. Generally, your hand will try to move slightly outward as you clench more tightly. You can imagine why this would be a problem and your rounds could end up here. For left handed shooters, the above pattern would be a mirror image. The targets are available below as PDFs, both with and without scoring rings, and are suitable for printing. I printed this out and am going to put it in my reloading binder. I am sure it will help when I am teaching new people to shoot. I don't need these, I am a perfect shot! Remember seeing this many many years ago before I became an expert shot like the rest here. I figure I'll print it to just for reference and to help others less fortunate. Glad to see these are getting some use. Don't forget to post an AAR with pics and let us know if they help you! They helped me! I kept hitting in either "tightening fingers" or "jerking trigger"
I have found that they help with my students. 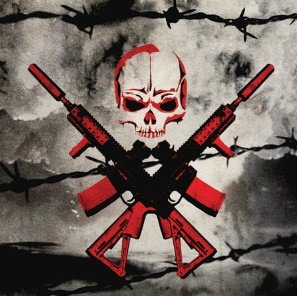 I can stand beside them, watch their hands, and tell whether they're jerking the trigger, relaxing too soon, or milking the gun, which seem to the most common errors with my ladies. I can tell them what they're doing and work with them on smooth trigger press and follow-thru...but for some reason, seeing the results on these targets hits home with them and sort of 'proves' what I've been telling them all along. So, for whatever it's worth, I think they're helpful. The ones I've been using are from L.E. Targets, but they seem to be the same diagram. these have been such big help that i had 2 register an let you know that we really appreciate these targets. great for training! Great discussion going on in the comments section of the blog post for these targets about reducing the size to simulate shooting them at a distance. That's me in a nutshell. I'm gonna try and stop my hand from moving outwards so much. Printing some to shoot at later this week. Thank you for these.